Peter Temkin brings a decade of experience to Show Dogs and specializes in charcuterie from pates and whole-cut dry-cured meats to fresh sausages. Peter began working with Chefs Gayle Pirie and John Clark six months ago as Show Dogs’ in-house Charcutier, and recently introduced five new specialty sausages to the menu including: Merguez, Wild Boar, Chicken Curry, Chicken Boudin and Maple Bacon. Each sausage is made with locally sourced meats but incorporate seasonings to mirror the regions from which the sausages are inspired. Peter was introduced to the culinary world in his youth while growing up in New York City -- his mother was a catering chef and his father was a book publisher for MCA/Universal's book division, now known as Putnam Books. This upbringing, coupled with travels to France and Italy, instilled an early appreciation for food and cooking traditions. He began his culinary career as an apprentice at Florio restaurant in San Francisco. Here, Temkin says, Chef Rick Hackett set his foundation for cooking -- learning everything from practical skills to the art of cured meat. 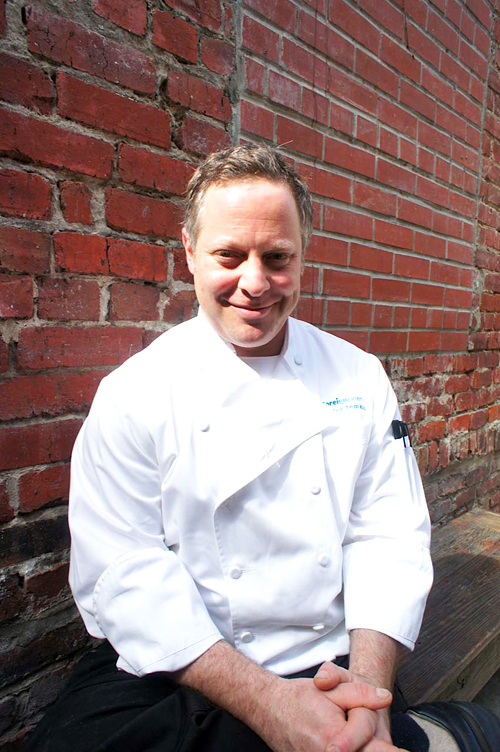 Since then, Temkin has been instrumental in the opening of Nopa, Spruce, and Cavallo Point’s Farley Bar, where he developed comprehensive charcuterie programs. He lives in South City. What’s new at the restaurant? Things are great and the in-house sausages are really singing. We're in the process of developing several new charcuterie offerings as well, which is very exciting. At Foreign Cinema, the housemade program is starting to hit its stride, now that the salumis are beginning to show. My chefs are so supportive and generous with their talent. I'm very lucky to work where I do. What are your favorite 2 spots to shop for food? Avedano's on Cortland and Olivier's Butchery in the Dogpatch. I also keep my eye on anything Good Foods Catering does. Chef Dontaye gets it done! Tell us about meeting your wife. My wife is Melody Mitchell, who is a certified sommelier and the lead server at The Village Pub. We met through mutual friends after a catering event. I went up to her and kissed her, and we've been together ever since. That was about 6 years ago, and we've been married for over a year and a half. My sun rises and sets with her. What are your favorite date night spots? Slow Club because the combination of the ambiance, the decor and Chef Matt Paul's food are just devastating.... My wife and I always order his flatbread, and I know he just put his short ribs on the menu. We'll have to get those, since I've heard they're just amazing. We also love Flower Lounge in Millbrae and, well, our house! We cook quite a bit together and the food's getting better all the time. My friend Jon Reitz just opened his first place, Cedar Hill Kitchen + Smokehouse, so we're looking forward to eating there as well. What is your favorite meal to have with your family? My wife's chicken thighs, braised greens and scalloped potatoes. As a teacher, what are the “musts” of making charcuterie? You have to keep your proteins clean, cold and covered. Don't let the fancy words intimidate you -- a pate is just a meat loaf that's had a couple of cocktails. Finally, patience and passion -- you'll need both to do charcuterie well. Do you have plans for the holidays and/or a favorite dish/recipe? Place meat on a full tray sheet for 20 minutes or until very cold. Grind lean and fat pork separately through 3/18" plate-make sure to chill all grinder parts for at least 20 minutes before grinding. Place ground pork, separating the lean and the fat, on a full sheet and keep refrigerated until all ingredients are assembled and ready to be utilized. Bring white wine to a boil and then off heat, crush the saffron between your fingers to release the essential oils of the saffron and then, put the saffron into the white wine and let steep into liquid is cool. Remove meat from fridge and combine lean meat with all seasoning and spices, by hand, break the fat into small pieces and incorporate into meat mixture. Mix white wine/saffron liquid into meat along with several glugs of ice water. Place starter culture into 3 oz of room temperature distilled water and vigorously incorporate solution by hand into meat mixture, make sure mixture is tacky. Stuff mixture into 34-36 mm hog casings, form sausages into 1/2 foot links, tying off links with double knots on both ends. Prick sausages with sausage pricker and hang on dowels and place in fermentation chamber for 48 hours. Place in drying room with a temperature of 58 degrees and an ambient humidity of 65-70% for 4-6 weeks or until sausages have given up approximately 40-50% of their water weight.